Here's at Samsung's CES keynote, CEO Boo-Keun Yoon is talking a big game about Samsung's ambitions for the internet of things. Within five years, he says ever single thing that Samsung makes will be a smart device that connects to the fabled Internet of Things. Among the promises? Samsung's Internet of Things will be O P E N.
It's just a promise for now, but it's a great one. For the smart home future to be real, you need everything to be able to talk and who in their right mind is going to pick a fridge based on how well it plays with the microwave. Sure, that's pretty obvious, but Samsung has been headed down that sort of walled off road for a while now, whether it's with wearables that only work with Samsung phones, or an AirPlay type thing that only works with Samsung PCs and TVs. Samsung's been notoriously horrible at this whole openness thing, so the promise to switch it up is a breath of fresh air. Of course there's still room for it all to go sideways if Samsung's idea of being open is just "Hey, everybody come use Tizen! Let's all play nice, but only at my house and the game I want to play." 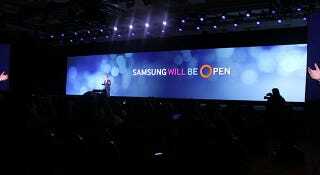 In addition to all the openness talk, Samsung is promising to really dive into the whole smart home thing. Within 5 years, Samsung says that every single thing it makes will be a smart, internet-connected. What will those smart devices look like? Samsung seems weirdly fascinated with a "smart cabinet" as an example; it's shown up no less than three times so far in this keynote, no doubt the recurring dream of a IoT-obsessed millionaire. Such a cabinet would know what you are drinking, when you are drinking it, and even refill your stash by buying things you like, you drunk. Slightly more widely appealing gadget ideas include a sleep sensor you slip under your mattress, and—of course—your car. In fact, with the new Touch Command app, you'll actually be able to control your car from your watch! If your watch is a Gear and your car is a BMW. Samsung's talking a big game, and it'll be a few years before we even start to see how it'll all shake out. For now, it's at least saying some of the right things.